Network analysis is used to determine the network performance in terms of voltage dips or boosts, transient events, frequency fluctuations, voltage interruptions and harmonics. The influence of inverters can cause disruptions. Additionally, the inverter is examined with regard to radiation and technical data. Network analysis is usually required when the inverter is frequently switched on and off. Too many switching procedures can reduce life and lead to lower yields. 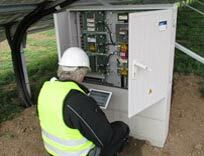 Measurements can be conducted on inverters to check 1- and 3- phase operation. Additionally, temperature behaviour can be examined with a thermographic inspection.